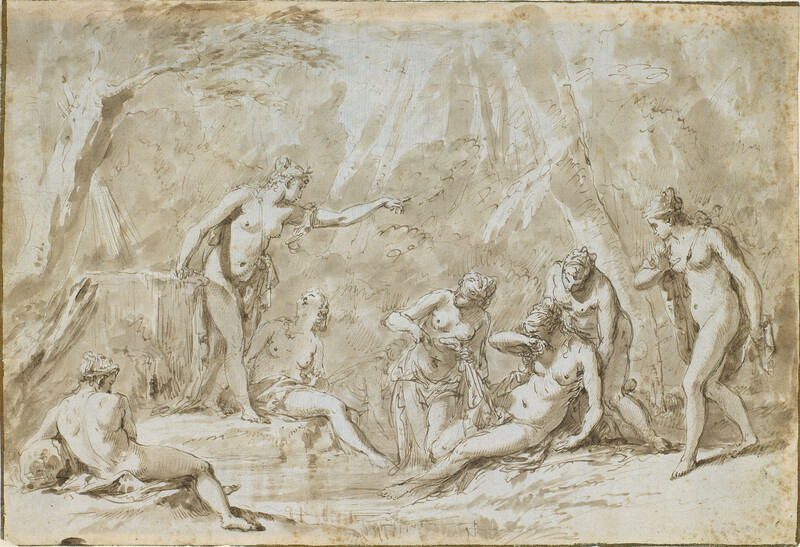 A pen and ink drawing of the goddess Diana discovering that one of her handmaidens, Callisto, is pregnant. Callisto was cast out of Diana's circle for her crime. A preparatory study for the fresco of the same subject painted for the apartments of Prince Ferdinand de' Medici in the Palazzo Pitti, Florence in 1707/8. In the fresco the scene is rendered in grisaille between a set of trompe l'oeil columns. Ricci painted several later versions of the subject but this study is closest to the Pitti fresco. The drawing dates from the earlier part of his career when the influence the Bolognese school as well as Parmigianino and Raphael is most evident.